Green cycle boxes: what's the point? The green cycle box is arguably the most high profile cycling investment in Northern Ireland in the last decade. Roads Service have mercilessly slathered green paint over junctions across the province, in one of many half-hearted attempts to convince people to get cycling on our roads. I cycle across 6 advanced stop lines (to give them their official title) every day, and I struggle to see the benefit. Their presence encourages some uniquely difficult road manoeuvres, if not actually putting cyclists at greater risk on some parts of our roads. This is bad enough, but when it turns it that vehicles are blocking cycle boxes at 58% of red lights in rush hour it’s time to ask some serious questions. Two years ago I got a mini video camera, which had a handy bike attachment. 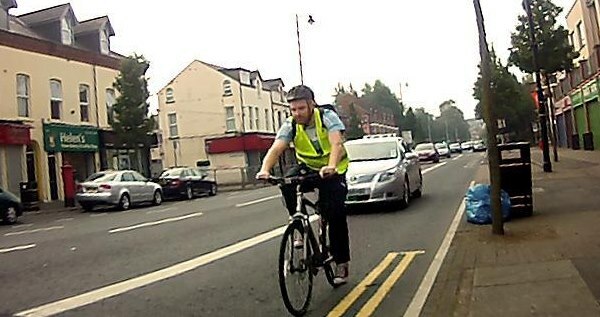 I started to take it out in 2012 to show some of the dangerous aspects of Belfast cycling. I’ve posted a few videos of dangerous overtaking moves, Maseratis hogging the cycle lane and to demonstrate the problem of illegally parked cars rendering Belfast’s cycle lanes useless. By forgetting to delete these files as I went, I accidently ended up with a large dataset ready for a personal mini survey of cycling around Belfast! For balance, I also checked for the biggest problem on our roads, red light jumping cyclists. During these journeys I encountered 625 cycle boxes. Just 370 had a red light, meaning I’m caught at these junctions 59% of the time. Discarding 44 red lights (12%) where I didn’t reach (nor have sight of) the cycle box leaves a group of 326 occasions where I could judge interactions with other vehicles. 138 cycle boxes were empty, but a whopping 188 cycle boxes had at least one blocking vehicle. That’s a blockage 58% of the time. These blocks involved a total of 285 vehicles, or typically 1.5 vehicles on every blocked cycle box. Just over a third of all blockages involved 2 or more vehicles. Each junction with a cycle box has different characteristics, but the stand-out junction for blocking is countrybound at The Mount (video below). This is a 3 lane junction with the outside right lane split to turn onto Castlereagh Street. The 2 ‘straight-on’ lanes benefit from cycle lane access all the way to the junction, but it’s useless for turning right. Of 88 red lights I stopped at, 75 had at least one vehicle blocking the cycle box – the junction suffers from at least one blocking vehicle at 85% of red lights in rush hour. Added to this, cyclists filtering across 2 lanes to reach the split lane find an incredibly dangerous mix of a light which can’t be timed and a tight gap between traffic islands. Cycle boxes (on this particular route) are not providing safe space for cyclists. Knowing your odds of getting comfortably and safely into dedicated cycle space is less than 50/50 means they are practically useless. Not all vehicles sitting on a cycle box have done it intentionally – many drivers will rightly stop on amber rather than try to speed through the junction, and this may mean coming to a safe halt beyond the first stop line. However the sheer levels of blockages recorded indicates more is at work than just being caught out by light phases. Whether there is a design solution to this, or it’s all down to driver education is up for debate. But there is that pesky question of enforcement..
What are the police doing to tackle cycle box blocking? This is despite a clear difference in the intent of a stop line with a cycle box (to provide safe space for cyclists) and the effect that offences committed here have on road safety. This is a clear failure, and must be addressed by local politicians. If there’s no evidence of enforcement, it’s fair to suggest there is no enforcement. I shared a red light cycle box with 102 other cyclists. There were 33 recorded instances of rule breaking, although 8 of these were directly caused by vehicles blocking the cycle box, forcing cyclists to advance ahead of the second stop line (picture below). What was the nature of the rule breaking? 20 cyclists positioned themselves slightly ahead of the cycle box (picture below), which gets more dangerous if you continue to edge forward. Pavement cycling was recorded on 4 occasions, but just 1 true ‘red light jumping’ cyclist was recorded, continuing across The Mount junction while the pedestrian crossing lights were green. For the record then (small sample it may be) that’s less than 1% of cyclists observed jumping a red light on these journeys. Reviewing these junctions led to another clear conclusion, apparently resisted by Roads Service as unnecessary – Cromac Square needs a yellow box junction. Of all the 370 red light cycle box encounters where I could observe the junction ahead, the way was blocked on green 35 times. Not bad, until you realise 27 blockages occurred at the Hamilton Street Exit at Cromac Square. That’s a wildly inefficient junction with 40% blockage rate at rush hour – time to get the paint bucket out Roads Service! The 6 boxes highlighted in this survey have very different characteristics. Just 2 have a cycle lane which protects a separate route for cyclists to reach the box, Hamilton Street Exit and The Mount (for straight-on cycling only). The others leave cyclists to filter through sitting traffic, with little physical space to do so, and perhaps most dangerous from a road safety design perspective, no idea if the light ahead will change before you reach the box. By far the worst cycle box for this is St George’s Market on East Bridge Street. A with-flow bus and cycle lane (which successfully excludes taxis) leads over the train bridge, followed by a bus gate (not triggered by cyclists) and then a short run to the junction with Oxford Street, notorious for vehicles quickly and sometimes recklessly changing lanes. In sitting traffic, it is virtually impossible to time the lights at the junction. With no separate cycle lane leading up to the cycle box (as with the Hamilton Street Exit), cyclists have a difficult choice – chance filtering down between traffic, or sit back and lose the benefit of the cycle box. The numbers bear this out, even for an experienced cyclist like me – at 42 red lights I only made it to the cycle box on 22 occasions (52%). Twice I stopped short of the box as it wasn’t worth passing 1 or 2 cars, but 18 times (43%) I was unable to judge the lights and so stayed back in the traffic queue. Recent census figures showed the concentration of commuter cyclists in South and East Belfast. This means the 2 major cycling gateways to the city are Ormeau Bridge and Albert Bridge (and by extension East Bridge Street) and this is a heavily used junction for cyclists. If nothing else, this mini survey shows attention is needed to provide better and safer access to this cycle box in rush hour. Grumbling motorists cite red light jumping cyclists as a menace; grumbling cyclists cite flashy car drivers or taxis as major dangers. Everyone seems to have a clichéd grudge against someone on the roads. 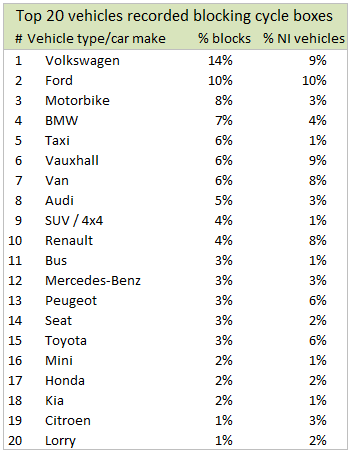 So let’s not labour the point, but here’s a breakdown of the types of vehicles (out of 240 identified marques) which blocked these cycle boxes, by car make and vehicle category – and what percentage of each are actually on the roads in NI. It’s a small sample with plenty of variables, so it’s just for fun – make of it what you will! Roads Service are about to make Belfast roads significantly more dangerous for cyclists, and risk jeopardising commuter cycling levels. A consultation on plans to open bus lanes to all taxis is closing shortly, but what is driving their preferred option? Roads Service’s stated preference is to allow taxis to use bus lanes, despite presenting no evidence of an overall benefit, save to taxi firms and drivers. Meanwhile, practically the only form of city-bound cycling infrastructure in Belfast is about to get much busier, and more dangerous. Currently bus lanes are dedicated space for buses, cyclists, motorcyclists and public hire taxis (black hackney cabs and ‘taxi buses’). These taxis had a monopoly in Belfast on the ability to pick up passengers from the street. Private hire taxis were only available through prior booking, and had no access to bus lanes. Although the legislation is NI-wide, I’m focusing on Belfast, as the majority of NI’s bus lanes are on this city’s arterial routes. From 1st September new taxi regulations came into force which effectively levelled the playing field in Northern Ireland – all taxis operate under one system, and any taxi can be hailed and pick up a fare from the roadside. In the absence of genuine opposition from cyclists and groups interested in sustainable travel, implementation of Option 3 will follow the consultation period. Why does this matter to cyclists? 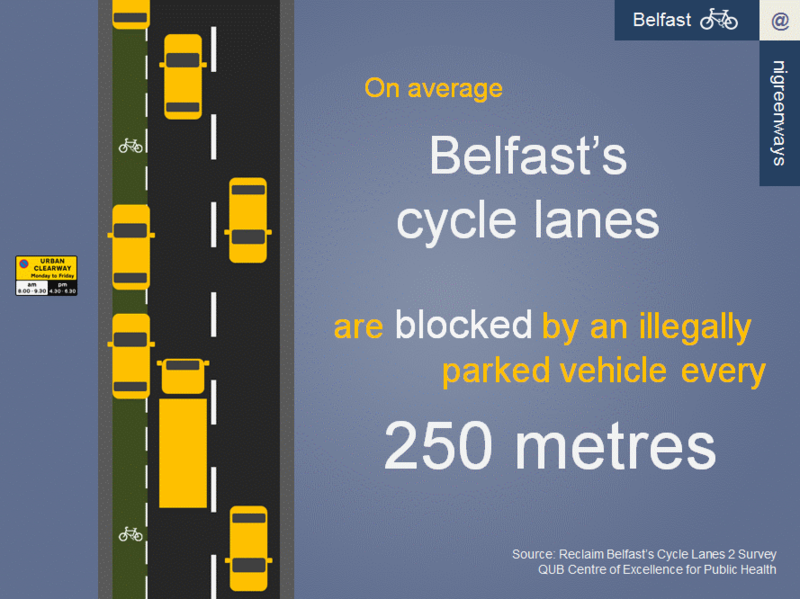 Belfast has very little dedicated cycling infrastructure, and commuter cyclists rely on the relative calm of bus lanes for a safer journey during rush hour. Numbers of cyclists appear to be on the increase, and although hard targets for uptake don’t exist in Northern Ireland, we have ‘aspirations’ to increase the number of journeys by bike. Allowing access to competitive commercial operators will both increase the volume of traffic and add more fast vehicles to bus lanes. How does this encourage more people to cycle, when instances of pressure from slowed taxis and dangerous overtaking attempts will increase? The arguments put in favour of allowing taxis access to bus lanes reaches its nadir: “Currently these taxis will generally be moving and will only stop to set down a fare, it would be rare that they would stop to pick up. It is felt this situation may not change greatly with the change in the taxi licensing regime, regular intending passengers on the routes in question will in all probability have chosen to use the cheaper bus service. It is also felt that dropping off may be fairly rare given that the destination will generally be the city centre or somewhere else away from the bus lane.” So to summarise, taxis really really need access to bus lanes, even though we think there’ll be little business for them there. Roads Service lays bare its complete lack of regard for cyclists – fast travelling taxis shouldn’t hamper buses too much. But where is the consideration that fast moving taxis and relatively slow cyclists, the group who we nominally want to grow, don’t mix well? What is the best option for cyclists? Option 1 would clearly be the best situation, if we value bus lanes as a way to encourage sustainable transport. Any slowing of bus journeys or increased conflict with vulnerable road users runs against all sense. Taxis are not a sustainable mode of transport and therefore should not enjoy a privileged position on the road. Option 2 is effectively a continuation of the current situation. It won’t do much to improve bus journey times or cycling uptake, but is an acceptable compromise. But continuing a two-tier system risks disadvantaging taxi drivers who do not drive wheelchair accessible vehicles. Option 3 should be rejected outright by Roads Service. Why is Roads Service confusing the issue? A simple and obvious option has not been included in the consultation. A less kind commentator might suggest deliberate obfuscation by Roads Service. There is a fundamental difference between ‘right of access’ to enter a bus lane and ‘right of travel’ for the length of a bus lane. The preferred Option 3 gives taxis full right of travel, a clear advantage over private cars and commercial vehicles to skip past queues of traffic. Yet the only Roads Service arguments presented in favour of option 3 concern the right to access a bus lane to pick up or drop off passengers. These are wholly separate arguments. The current legislation states “a person shall not…cause or permit any vehicle…to enter, proceed or wait in a bus lane”, apart from those permitted. The solution is to grant in legislation the right for taxis being hailed to enter a bus lane and temporarily stop to collect a passenger. However, the taxi must then exit the lane and continue its journey in the main traffic flow. Under Roads Service’s preferred option, taxis will be routinely stopping in bus lanes for this purpose anyway, holding up other permitted traffic. It’s the general usage of the lane for travelling which brings taxis directly into conflict with cyclists, something the consultation document utterly fails to address. But this is not surprising given our record on cycling measures. Giving taxis full right of travel in bus lanes harms the effectiveness of the scheduled public transport system, dissuades current and potential cyclists from using the lanes, and makes a mockery of Northern Ireland’s sustainable travel aspirations. I have come to the conclusion that civil servants and politicians in Northern Ireland are trying everything in their power to drive cyclists off the road. Wasting money on unenforceable advisory cycle lanes is one thing, concentrating what budget is left on cycle boxes which cyclists can’t safely get to is another. But proactively creating conditions to scare potential cycle commuters to stay in their cars, while happily accepting slower bus journey times, and making the road conditions less pleasant and more dangerous for existing cyclists is moving things on to a new level of incompetence. Buses and cyclists are an uneasy mix in Belfast, but the current situation seems to be just about acceptable to increasing numbers of commuter cyclists. We share the bus lanes with a few motorcyclists, and the occasional black cab. 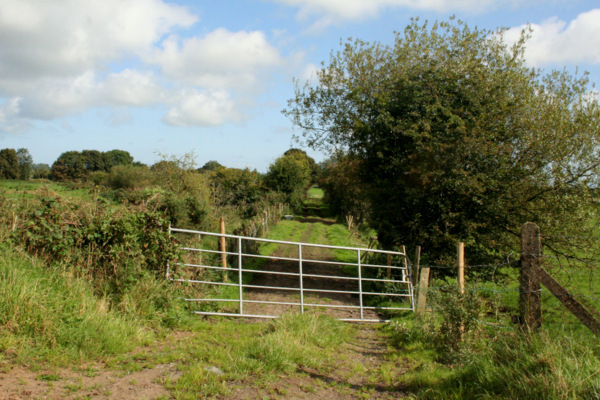 Northern Ireland has been crawling slowly towards a more sustainable transport system, despite best efforts to obstruct progress. Throwing hundreds of taxis into the rush hour mix is simply crazy, but an understandable product of our current road strategy and mismanagement. The consultation is open until Friday 21st September 2012. It is imperative that the views of cyclists who use bus lanes are made clearly to Roads Service. Despite the clear preference, there remains the possibility to change minds. Give your response to the consultation here, and raise the issue with your local councillors and MLAs. Take action before it’s too late.